In the mythical land of Aztlán, four tribes strive to survive and prosper under the scrutiny of the gods themselves. Since War of the Ring is one of my favourite games, it was an honour to do the graphic design for this latest Ares Game, Aztlán, which also hooked me up with illustrator Drew Baker of Ninjato fame again. The game features simple but ingenious rules and is set in the mythological homeland of the ancient Aztec peoples. 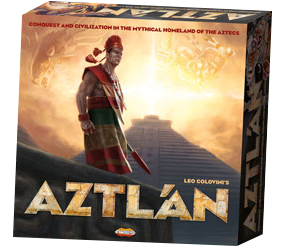 In 2012/13 one of my boardgame graphic design projects was Aztlán, by Italian publisher Ares Games (BoardgameGeek link). As I did on Ninjato, I was lucky enough to be asked to work with evocative images by illustrator Drew Baker. It was also a pleasure working closely with Roberto Di Meglio, one of the designers of an all-time favourite game of mine, War of the Ring, and a director of Ares Games. Aztlán is an elegant and clever design by Leo Colovini (Cartagena, Clans, Inkognito, Atlantis) with some fascinating twists—I particularly like the way the victor in a battle can choose to conquer his enemy or peacefully coexist with him (to receive a ‘prosperity card’ in return). Ares Games have done a wonderful job on the production, particularly with the plastic box insert, the colourful plastic tribe pawns and the ingenious score markers, which stack together into a ziggarat when you go above 100 points.